South African and international human rights bodies have expressed horror at a resolution tabled by South Africa at the United Nations to establish an intergovernmental process to discuss defining "sexual orientation" and "gender identity". South Africa has been accused of "collaborating with governments that refuse to acknowledge discrimination on the basis of sexual orientation" and of ignoring its own constitution, which prohibits discrimination based on "sexual orientation." In both their statement to the UN Human Rights Council and in the resolution they put forward South Africa said that "the issue of sexual orientation needs to be clearly defined." This argument has been put forward by some African countries as well as the 57 member Organisation of Islamic Conference (OIC) as LGBT rights have made steady gains in international bodies. Jessica Stern of the International Gay and Lesbian Human Rights Commission said that the reason for the resolution was because "South Africa has put regional political interests before human rights and is trying to appease other African countries." OIC and Arab states have also sought to fight LGBT progress as a 'human rights violation' through the “defamation" of religious ideas resolution, which has received extensive support at the UN and is also backed by the Vatican. This is seen as part of an attempt at a wholesale redefinition internationally of the concept of 'human rights'. South Africa alongside China, Russia, and Cuba have backed the 'defamation' resolution at the UN. However last year some fellow African nations broke with a decade of votes for it: Cameroon, Burkina Faso and Benin abstained and Zambia voted against. Similarly, the December vote against extrajudicial killings at the UN - which included "sexual orientation" and was the focus of extensive lobbying - saw one third of African countries either be absent, abstain or vote for the resolution, including Rwanda and Angola voting yes. South Africa also votes yes - having earlier voted no - following lobbying by South Africans, and it cited as a reason for the change a "constitutional imperative." In the debate on the extrajudicial killings resolution the Rwandan delegate pointedly referenced his country's experience in saying that a group does not need to be "legally defined" to be targeted for massacres. "We can't continue to hide our heads in the sand" he said. "These people [LGBT] have a right to life." 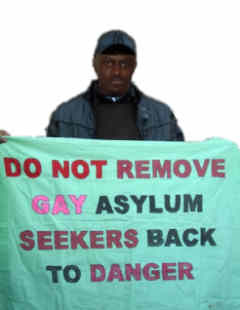 South African LGBT activist Zackie Achmat, co-founder of the Social Justice Coalition said that the South African proposal would stop any further UN investigation or report on sexual orientation and gender identity anywhere. "If enormous hate crimes happen, as in Uganda, then the UN can't investigate. It must first decide what sexual orientation means." He said the resolution also suggests that sexual orientation and gender identity are not part of international law. Achmat, noting South Africa's constitutional protections of LGBT rights, said that: "as it stands the [UN] resolution would be unconstitutional." The South African foreign ministry said: "The issue of sexual orientation is sensitive and impacts on a whole range of issues … this issue should be addressed openly, transparently and inclusively. The South African Lesbian and Gay Equality Project is this week expected to launch a case in the South African constitutional court to force the government to align its foreign policy with the constitution.